I live near a good sized mall on the Eastside of Cincinnati, Ohio. My wife and I often joke about how people are embarrassed to park near the Sears store. Cars are normally clustered around mall entrances and other anchor stores, but never around Sears. As a child I loved going to Sears with my grandparents. My grandfather would take me to the hardware department and I’d jump on the lawn tractors and play. It was a child’s fantasy having all the cool things Sears sold. There were those appliances too. The Kenmore brand, then sold only and exclusively by Sears, was the appliance brand in almost every house in my blue collar, middle class hometown. Sears was catalog sales, departments stores in American downtowns and in shopping malls everywhere. Sears was the American middle class. A friend of mine, Rocco Pendola, is a columnist for thestreet.com. Weeks ago he wrote a wonderful series of articles, complete with evidential pictures, on how Sears and other department store retailers should be ashamed of themselves for what they’ve allowed to happen to their brands and stores. The stores are outdated, poorly stocked and just a mess. Rocco was on to something. Since those articles first appeared I thought about why. Management can’t be this careless. It can’t totally be a result of growing online sales. So what is going on? It’s not only happening at Sears, K-Mart and J.C. Penny. It’s happening at Walmart too. Each of these retailers cater to the middle class and the middle class basically can’t afford to shop there any longer. The top 5% of wage earners have increased spending by 17% since the recession ended in 2009. The remaining 95% just 1%. Stores such as Nordstrom are doing great. Most luxury or upscale brands are. The New York Times in a recent article showed the growth in appliance sales for General Electric is with their high-end brands, where refrigerators can cost more than $3000. The article notes the business world sees the middle class eroding and companies are now focusing their products on a smaller, but much more affluent segment of the consumer pie. Some restaurants are struggling too, while others are growing. Darden, which owns many different restaurant brands aimed at different consumer segments, sees some of their brands doing well and some poorly. Olive Garden and Red Lobster are having a tough time, while their upscale Capital Grille chain is doing just fine. Internal Revenue Service data shows taxpayers who made $100,000 or less was 60% of the total income in the U.S in 2000. In 2011 that dropped to less than 50%, meaning there are fewer middle class Americans with money to spend. 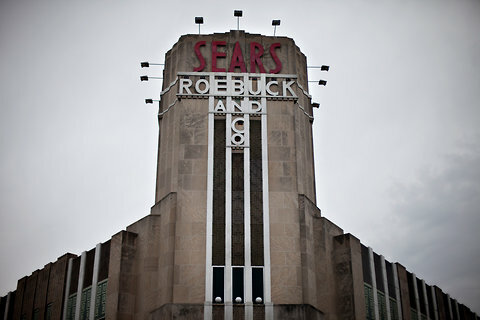 Ultimately, to Rocco’s point, it comes down to the management of stores such as Sears to forecast and adjust their businesses to changes in the economy represented by a dwindling American middle class. It just sad to see the fantasy of a child be lost forever. One of the best Restore American Jobs blog on the net.